I am in the middle of writing a blog post about something or other. I wasn’t done with it. WordPress posted it anyway for about five minutes and 1.7 people might have seen it from Twitter or wherever because I’m on my iPad. Sorry about that. What a great start to our year. Perhaps no one is reading this. Perhaps I should go to sleep. These are the kinds of problems that I had long ago, when the diplodoci roamed the internet. I’ve been on here too long for this silliness. ps. tomorrow I will take a photo of something. maybe food. pps. I will also maybe include a poem because a lot of you started following for that and I feel like I am falsely advertising here with my whining about how I do not blog flah flah wah excuse excuse-itty-poo rather than just write-writing away. Perhaps I will write a nice poem about blogging for an audience, like a circus pony. I am not trying to be sarcastic. I think I have a disease right now where everything I say sounds sarcastic, like Sarcasmiosis (which was not a very creative name for that) or maybe we will call it Splarvus Syndrome, for when you are afflicted with the sarcazzies. Anyway, I’ve started blogging another blog right here now during this edit–which I resolved not to do (even though that was Not one of my resolutions (not that I made any)). … and forty-one gives up without a fight, two months before it had planned on it–two months shy of birthday lift-off. 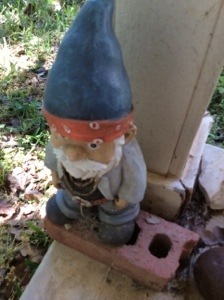 Gnome more Mondays (part 2h….. Apologies! My first post posted twice! Here’s another surprise gnome for your trouble!